Galleri Thomassen is pleased to present the exhibition For the Greater Good by Vanna Bowles. The exhibition consists of drawings, sculptures and mixed media installations. 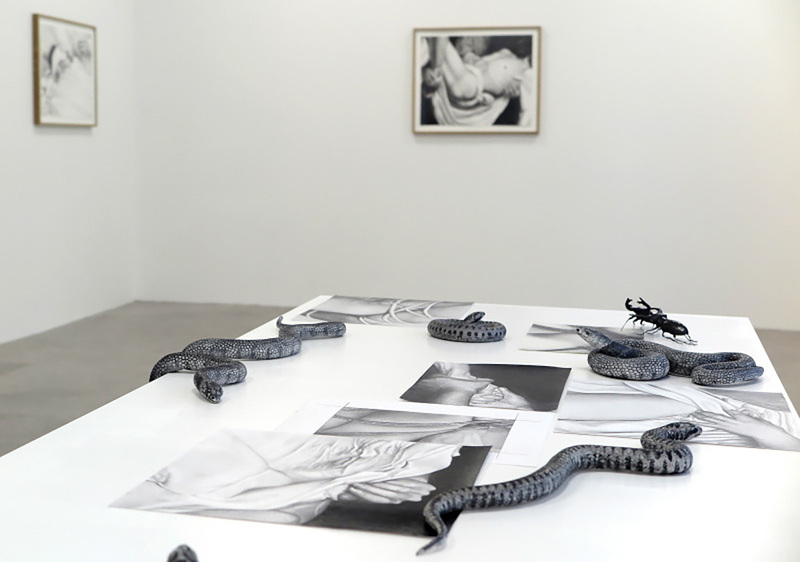 In her work Bowles explore the medium of drawing in combination with sculpture, objects and performance. Stylistically she works with a figurative, photorealistic surreal visual language. Recurring in her work are the use of optical effects and reliefs as a means to destabilize the dividing line between the two-dimensional image and the physical space of the gallery. Bowles’s imagery is concentrated around birds, insects, reptiles, and parts of the body. Her work consists of fragments such as a human hand or the wing of a bird. She assemble them in new constellations that become intricate three-dimensional collages. Thematically Bowles explores different aspects of vulnerability. Her use of fragile and perishable materials, left bare and exposed to the elements further underscore this overall theme. Vanna Bowles (born 1974 in Gothenburg) lives and works in Oslo. She received her education from the Royal Academy of Art in Oslo and Universität der Künste in Berlin. She´s had multiple solo exhibitions including exhibitions at Angelika Knäpper Gallery in Stockholm, former Lars Bohman Gallery now Galerie Forsblom in Stockholm and Kunstnerforbundet in Oslo. Her work has been included in exhibitions at Malmö Konstmuseum, Stenersenmuseet in Oslo, Kunstnernes Hus, Oslo, and at Lillehammer Kunstmuseum. She is the recipient of numerous residencies and grants, including a 10-year artists working grant from Norsk Kulturråd (2016). Her work is represented in multiple private and public collections, such as Statoil/Hydro Norway, Lillehammer Kunstmuseum, Malmö Konstmuseum, and Statens Konstråd. This is Vanna Bowles´s fourth solo exhibition with the gallery.